1934... an aspiring writer asks Ernest Hemingway what books he should read to become a great author. 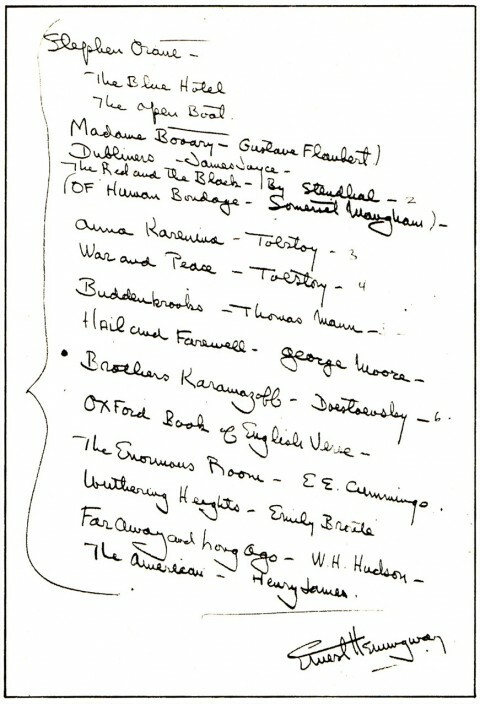 Hemingway writes him a list of must-reads for the budding literary god (14 novels and 2 short stories). Today... we are reading our way through this list, one chapter per day, and discussing the day's chapter (via our subreddit), to create a daily podcast. Well, because this is the path to literary greatness - as ascribed by Hemingway himself. Listener - Want to reach god-tier literary genius status without all that pesky reading? Subscribe to the podcast and listen along for the ride. Contributor - If you want to be part of the daily chapter discussion, you'll need to keep up with the podcast and join us on our subreddit. It's akin to being part of a massive, world-wide, ultra-ambitious book club. Your comments and insights will then become part of the podcast.